Yes, you read that correctly. Longrow 21 year old. It's a single refill bourbon cask sold only during Open Day 2016. 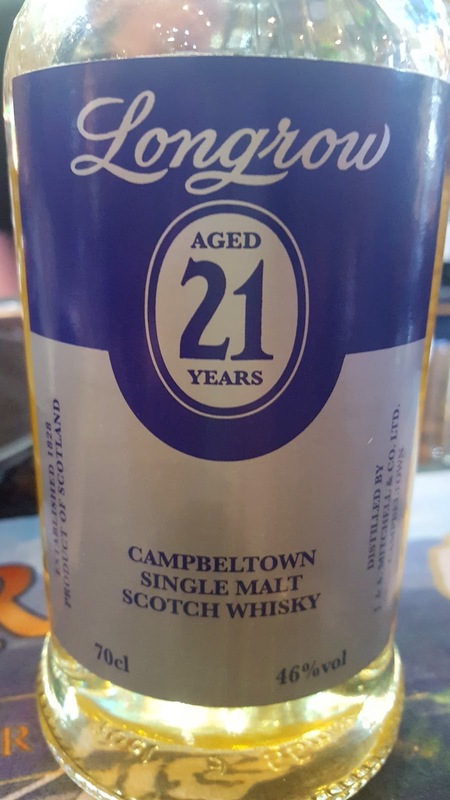 When I saw one bottle of Longrow 21 at Cadenhead in Campbeltown, I was like &$&^%@#$!@! HOW MUCH MONEY COST THIS???? I was told the bottle was just for display. :( Three hours later I discovered that Ardshiel Hotel had an open bottle at their bar. :) I carefully deposited my paid pour into a sample bottle and brought it back home in my luggage. On a related note, now that I've tried a half dozen Open Day bottlings from over the years, I'd rather attend the Campbeltown Malts Festival than join the hoards for Feis Ile on Islay (the two of which basically dovetail in May). It has my favorite whisky color, five beer piss, very light for a 21 year old whisky. The lovely nose starts off with grapefruits, lemons, peaches, and dried apricots. The mango-lime smoothie (Mango Cardamom Blast, to be specific) my wife makes once a week. There are hints of pine needless, toffee pudding, seaweed, and hay. It gets more phenolic with time, picking up some farmy notes along the way. Meanwhile the palate is much farmier and earthier than the nose. It's very minerally with subtler lemon notes underneath. A hint of metal. A sharp metallic bite. With time it gets spicier and slightly fruity. A slight Laphroaig-ish salt/medicinal/iodine note appears as well. Its texture and mouthfeel is oddly thin throughout, though. The finish has light smoke and ash, lemon and lime. Salty beach air, delicate sweetness, and slight barn note. The nose feels younger now, peatier. The fruit retreats, though maybe there's some blueberry pie. More cow barn. The palate picks up a big peppery bite and becomes more astringent, harder to crack. Dirtier, sharper peat. A quiet mango note, but mostly tart acidic citrus. Like the nose, the finish comes across younger. It's ashy, dirty, with lots of black pepper. Hints of mango and lime. 1.) This is the perfect example of a whisky that's light on oak yet well matured. 2.) The nose is stunning. No water please. 3.) 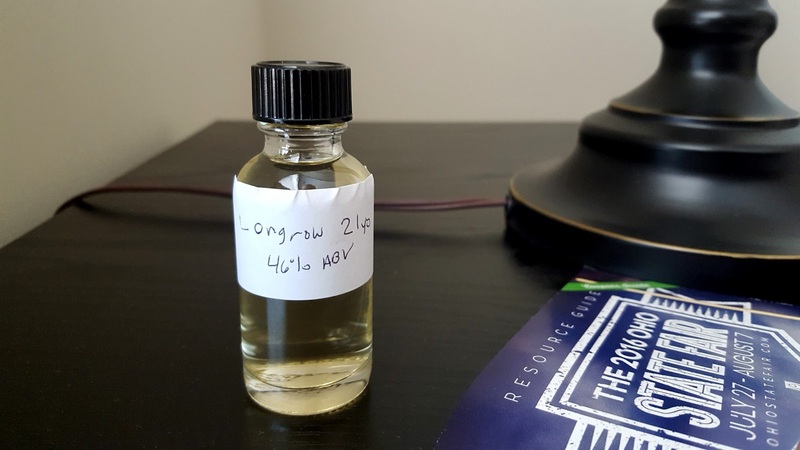 When a regular Longrow 21 comes out, it should be excellent as a small batch. I mentioned the small batch part because the palate is not this whisky's strong point. As referenced in the notes, its mouthfeel is watery and becomes a slight distraction. The finish is a bit shorter and plainer than I expected. I'm probably picking nits here because the whisky tastes good, but it comes nowhere near the fabulous nose. 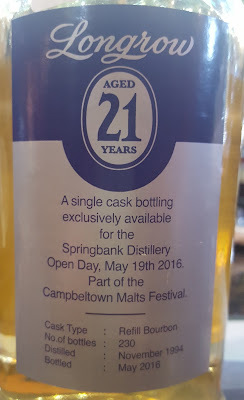 If Springbank were to put together a small batch of 10 casks or so (an 1800-2000 bottle release), they could be able to blend up the palate's quality. Perhaps a couple slightly oakier casks might help too. Overall, this a very good, almost great, whisky. I don't know what it had cost at the festival, but if you're reading this post and you did scoop up a bottle, congrats! Otherwise, we'll just have to wait to see if there'll be another 21 for the rest of us.